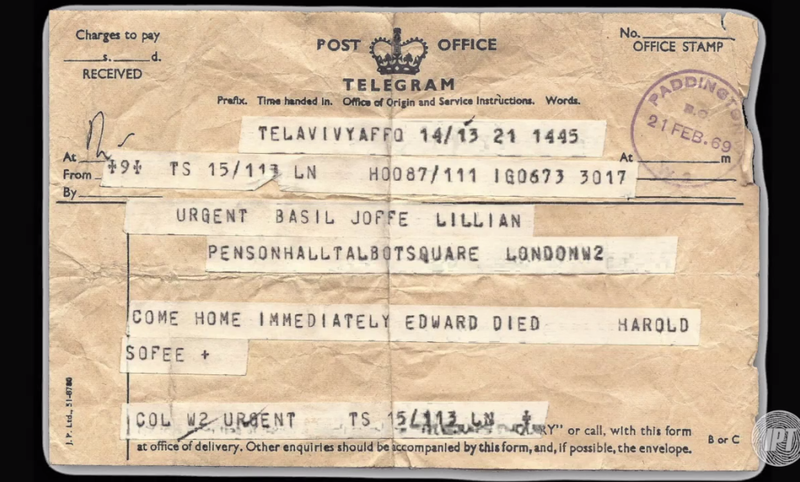 Imagine learning that your brother had been murdered by a terrorist via telegram. That is exactly how one of Edward Joffe's brothers had the news broken to him. Image from Investigative Project (http://www.investigativeproject.org/4634/part-3-spinning-a-terrorist-into-a-victim-rasmieh). When I first heard that Students for Justice in Palestine would be holding a fundraiser for Rasmea Odeh, a convicted terrorist, I have to say, I was slightly shocked. Then after a second, I realized there is nothing for me to be shocked about. Let’s examine what exactly this resilience is. A few months ago, I read a piece in National Review, which was where I first learned about Rasmea. It makes it crystal clear that any support for her amounts to nothing more than supporting a murderer who is proud of her past (more on that shortly). In 1969, a bomb went off in a candy box in a grocery store in Jerusalem. Two young men were murdered, and a second bomb was defused before it could slaughter the first responders (Odeh was described as disappointed at this by her friend in a documentary, Women in Struggle). To put this in context, American college students are now celebrating the brutal murder of kids around their age by glorifying one of the perpetrators of their murder. The story goes on. After this double murder, Odeh was sentenced to life in prison (keep in mind that there is no death penalty in Israel, despite the fact that many of its neighbors have no qualms executing their own subjects merely for being gay), but she was released in a prisoner swap after only 10 years. In the 90s, she made her way to the United States. If it seems odd that we let a convicted terrorist in so easily, that’s because it is. Odeh lied on her own immigration papers, saying she had never been convicted of a felony (which is obviously a crime). As if she hadn’t lied enough already, in her application for US citizenship she once again lied about her own past. All of this is particularly strange to me given how proud she is of her record as a terrorist. In the aforementioned 2004 (the same year she lied on her citizenship papers) documentary, Women in Struggle, Odeh’s friend (who jointly perpetrated this bombing) explains how Odeh was even “more involved than I was” in the bombing. “1. Rasmea was just a political activist prior to Israeli arrest, picked up because of political activities. “1. Prior to her arrest in Israel, Rasmea was a military participant in and organizer for the Popular Front for the Liberation of Palestine (PFLP). The notion of Israel arbitrarily rounding up and detaining hundreds of Arabs is nothing more than an outright lie. Despite claims that Rasmea has since made about her only having confessed after almost a month of torture, the facts show that she actually confessed…after one day. Despite claims that Odeh did not receive a fair trial in Israel after the bombings she clearly committed, the US court in which she is being tried has received reports of her Israeli trial, which read like a normal trial account. She even demanded that her original judge in her American trial recuse himself…because he is Jewish. Now that the facts have been laid out, and the lies have been exposed, it’s worth asking once again, why is SJP supporting someone who is by any definition a terrorist (I didn’t even mention her failed attempt to bomb the British Consulate in Israel a few days after her successful supermarket bombing). To put this in the larger context, it’s almost fitting that SJP is hosting this fundraiser mere days after swastikas were drawn on UC Davis’s AEPi (which itself occurred a day after BDS passed their student government). This clearly sounds like a movement that’s all about peace, right? Sadly, none of this is too shocking, since UC Davis has had its own fair share of problems about intimidation of pro-Israel students in the past (for a more extensive accounting, click here). Although I’m sure I will sadly need to write about the ridiculousness of BDS in the future, for now I will just post a video by a South African who lived through true apartheid, as well as Alan Dershowitz’s thoughts on ten reasons why BDS is immoral and threatens peace. Again, I have no idea why anyone in their right mind would stand by, let alone provide material support to a murderer like Rasmea Odeh. However, SJP isn’t known for making fact-based decisions, and this is just another indication of that. In researching this more than I had previously, the following articles were so invaluable that they deserve another shout out: Rasmieh Gets Justice and Rasmea Odeh rightly convicted of Israeli supermarket bombing and U.S. immigration fraud. Finally, for a first person account from a Rabbi at DePaul, who highlights the hypocrisy of this institution having this fundraiser, click here. Imagine learning that your brother had been murdered by a terrorist via telegram. That is exactly how one of Edward Joffe’s brothers had the news broken to him. Image from Investigative Project (http://www.investigativeproject.org/4634/part-3-spinning-a-terrorist-into-a-victim-rasmieh).